이기룡필 남지기로회도(李起龍筆 南池耆老會圖)는 조선 중기 도화서 화가였던 이기룡이 70세 이상의 원로사대부로 구성된 기로소 회원들이 풍류를 즐기고 친목을 도모하기 위한 모임 광경을 그린 것이다. 가로 50㎝, 세로 60.5㎝의 비단 바탕에 그린 이 그림은 서울 숭례문 밖 남지에서 열린 모임을 그렸다. 그림 위쪽에 ‘남지기로회도’라고 쓰여져 있으며 좌우와 아랫부분에는 참석인원들의 관직·성명·본관 등의 내용과 모임의 성격이 기록되어 있다. 기로소 회원 12명의 계회모습을 그렸는데, 연꽃이 피어있는 연못을 중심으로 좌우의 앞에 버드나무 한 쌍이 그려진 짜임새 있는 구도이다. 이러한 기로회도는 계회도의 일종으로 조선 전기에는 계회를 하고 있는 선비들을 작게 표현하여 배경이 전체를 차지했던 반면, 이 그림에서는 계회장면이 부각되고 산수배경의 묘사가 줄었다는 것에서 조선 중기 계회도의 특징을 찾아볼 수 있다. Namji girohoedo (Gathering of Elders by Namji Pond) represents the meeting of Giroso’s members. As the meeting of senior high government officials aged over 70, Giroso promoted mutual friendship and love for poetic works. 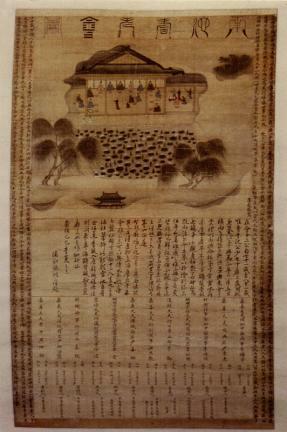 Yi Gi-ryong, one of the painters of Dohwaseo (Bureau of Painting) of the mid-Joseon Period, drew this painting to depict the scene of the elders’ gathering held at Namji Pond outside of Sungnyemun Gate in Seoul. The title of this painting is written at the top, with the participants’ names, titles, and places of origin explained on the right and left sides and at the bottom along with the characteristics of this gathering. The main scene right under the upper part depicts the meeting scene of 12 Giroso members. Its composition is very stable -- there is a pond with lotus flowers at the center as well as a pair of willows on both sides. As a type of gyehoedo (painting of the gathering of officials), this painting shows the notable contradiction compared to similar ones produced in the early Joseon Period because the scene of the meeting is highlighted together with its background. In contrast, the paintings of the early Joseon have the background of landscape covering almost the entire frame, with the scene of the meeting expressed only symbolically.